Will Tim Allen take a seat? Has the Last Man Standing TV show been cancelled or renewed for a seventh season on ABC? The television vulture is watching for the latest cancellation and renewal news, so this page is a dedicated place to track the status of Last Man Standing season seven. Bookmark it, or subscribe for the latest updates. Remember, the television vulture is watching your shows. Are you? Airing on the ABC television network, Last Man Standing follows straight-talker Mike Baxter (Tim Allen), a man surrounded by women. While this sporting goods store marketing guy is blessed with common sense, Mike is a little low on what some call political correctness and others call manners. Also starring are Nancy Travis as Mike’s wife, Vanessa; Molly Ephraim as daughter Mandy; Kaitlyn Dever as daughter Eve; Amanda Fuller as daughter Kristin; Jordan Masterson as Kristen’s beau, Ryan; Flynn Morrison as grandson Boyd; Jonathan Adams as neighbor Chuck Larabee; Christoph Sanders as co-worker Kyle Anderson; and Hector Elizondo as bossman Ed Alzate. The sixth season of Last Man Standing averaged a 1.15 rating in the 18-49 demographic with 6.41 million viewers. Compared to the fifth season, that’s down by 5% in the demo and down by 5% in total viewers. Learn how Last Man Standing stacks up against the other ABC TV shows. On May 10, 2017, Last Man Standing was cancelled. Could it be picked up elsewhere? Stay tuned for further updates. Last Man Standing is still performing solidly for ABC. In addition, the sitcom does well in syndication. In first run, Last Man Standing typically wins its Friday night timeslot in the coveted 18-49 year old viewer demographic. The comedy series has also been outperforming the sophomore season of Dr. Ken, for which it serves as lead-in. 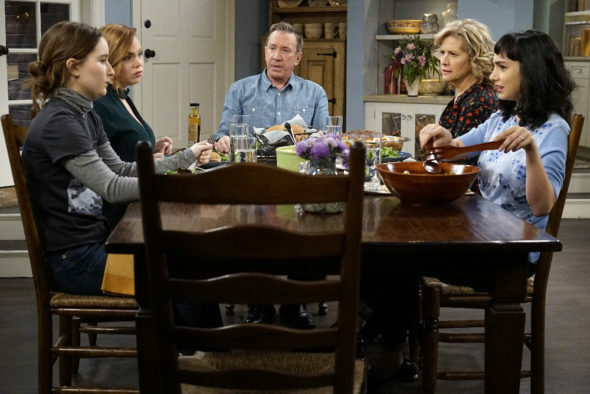 It seems likely ABC will renew Last Man Standing for a seventh season, as long as the cast is willing and production costs are affordable. Find more Last Man Standing TV series news or other ABC TV show news. What do you think? Did you hope that the Last Man Standing TV series would be renewed for a seventh season? Are you sorry that it’s been cancelled instead? Love this show. Watch all the refund every day. Bring it back!